Call centre workers form a significant part of the UK workforce and carry out a vital role on the frontline of many organisations. Call centre work can be stressful and sometimes workers find it difficult to cope with the demands placed on them. UNISON aims to improve conditions for call centre workers by working with employers to raise awareness of the importance of the work call centre staff do and the common stresses placed on them. Call centre staff do an important job helping organisations communicate and assist their customers. The work can cause stress, with workers sometimes facing pressure to meet high targets. Call centre workers may use software which tracks the amount of calls they need to answer and how long is spent on each call. This can make it hard for them to leave their desk for a break. Computer systems also monitor workers and compare their performance to demanding targets and call handling standards. 1. Provide regular voice breaks (on average at least five minutes of non-vocal time per hour. At high-volume call centres or where the work is very repetitive, more non-vocal time may be needed). 2. Provide easy access to fresh drinking water. 3. Provide the ability to pre-record introductions. 4. Minimise background noise so that workers do not have to raise their voices. 5. Ensure that calls are rotated, to prevent calls being received at a single station. 6. Ensure that workers suffering from colds or sore throats are rested from telephone work, as the additional strain can cause serious damage to their voice. As a member of UNISON you get the support and advice of your representative (rep) and the full support of our organisation. By joining with UNISON’s 1.3 million members you can help to improve your pay and working conditions. Speak to call centre workers in your workplace to find out about their concerns. Am I allowed to take breaks from my desk? Yes, you are entitled to take regular breaks. By law you are entitled to a rest break of 20 minutes if you work six hours. During your rest break you are free to leave your desk or place of work. 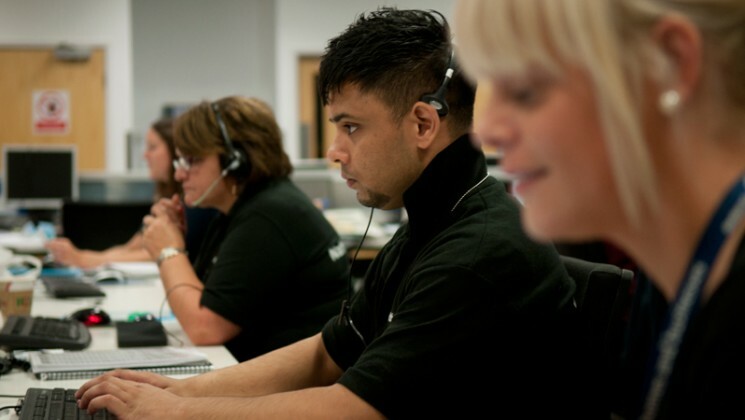 What can employers do to minimise health and safety risks to call centre workers? It is important that call centre workers take regular breaks, have access to fresh drinking water and can perform alternative tasks when they have an illness that may affect their voice, such as a cold or sore throat. Employers can also reduce background noise so workers don’t have to raise their voice. I feel stressed because I am constantly pushed to reach unrealistic targets in my call centre. What can I do? Speak to your UNISON rep to get advice and support. Your rep may speak with your employer to negotiate more reasonable targets.